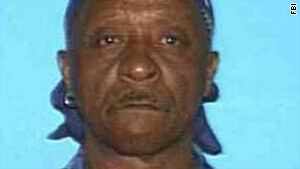 Johnny Lee Wicks, 66, was arrested for murder in Memphis, Tennessee, and had a long rap sheet. (CNN) -- Johnny Lee Wicks, 66, was carrying a 12-gauge shotgun when he walked Monday into the Lloyd D. George Federal Courthouse and started firing, shooting court security officer Stanley W. Cooper and a deputy U.S. marshal, said Kevin Favreau, special agent in charge of the FBI's Las Vegas office. The two victims returned fire, driving Wicks out of the courthouse, and pursued him into the street along with two other marshals and three other court security officers -- a total of seven officers, authorities said. During the ensuing exchange of gunfire, Wicks fired a total of five rounds, authorities said, while the officers fired a total of 81. Wicks was shot in the stomach and fatally shot in the head, Favreau said. Cooper later died of his injuries. The deputy marshal's condition has stabilized and he was released from the hospital, said Gary Orton, U.S. marshal for Nevada. Authorities said the deputy marshal's name would be released after he recovers further. Orton said he was about 48 and had more than two decades of service with the U.S. marshals. Wicks had a lengthy criminal history, Favreau said, including arrests for murder in Memphis, Tennessee, in the 1970s; arrests for drug charges in the 1980s in Memphis; a 1995 arrest for sexual assault and domestic violence in Sacramento, California; and a 1996 arrest for robbery and domestic violence, also in Sacramento. It was unclear whether those arrests resulted in convictions, and authorities did not have information on whether Wicks had been incarcerated. In 2008, Wicks filed a race discrimination and civil rights claim against the Social Security Administration, alleging he was denied full benefits because he was African-American, according to court documents. A federal judge -- located in the Las Vegas courthouse -- ruled against him in September. Those who knew Wicks told authorities he had an "overwhelming anger" toward the government, Favreau said. However, he had made no threats that police were aware of, and investigators do not know why Monday was the day his rage boiled over. Evidence indicates Wicks intentionally set his apartment on fire about 5:05 a.m. Monday, then walked three miles to the courthouse, Favreau said, where the shooting took place about 8 a.m. Witnesses said Wicks was clad in black when he walked inside, pulled out the shotgun and opened fire. Police believe he acted alone. "An act such as this cannot be predicted," said Doug Gillespie, sheriff of the Las Vegas Metropolitan Police. He and other officials praised Wicks' victims for acting quickly to repel the gunman. Cooper, a former sergeant with the Las Vegas Metropolitan Police who had been a contract security officer since 1994, "dedicated his entire life to protecting others," Gillespie said. "He was not only a good man, he was a great man." Cooper was able to fire one round while pursing Wicks, authorities said. The sheriff said he did not know whether funeral arrangements had been made for Cooper. 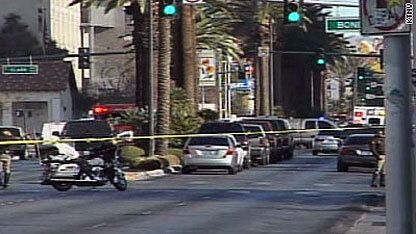 Wicks fired three rounds inside the courthouse and two others outside, said Las Vegas police Lt. Lou Roberts. The last two were fired when Wicks turned to face the pursuing officers, and he was fatally shot shortly afterward, Roberts said. He died among the bushes in front of an old school that once housed a temporary police headquarters. Wicks had more rounds available, Roberts said, but would not elaborate, citing the ongoing investigation. The officers involved in the firefight have been placed on administrative leave, authorities said -- standard procedure for officer-involved shootings. Witnesses to the exchange of gunfire Monday estimated at least 40 shots were fired. A one-minute, 13-second video clip posted on YouTube includes at least 45 gunshots, many in rapid succession. Nicholas Gramenos, who recorded the clip, said he was leaving the courthouse when the shooting erupted. Another witness, Bobby Scottland, told CNN the shots "sounded like popcorn." Cones were scattered across Las Vegas Boulevard Monday evening, with each representing a slug or shell casing from the gun battle.